My hubs and I are going away for the weekend for some much needed refreshment with one another and with the Lord. Can. Not. Wait. If I don’t respond to your calls, texts, emails or smoke signals, that’s why. ;) A few years ago prior to marriage I was impressed by the Lord to consider taking one day or weekend per month where I would get away with Him to be refreshed, rejuvenated and refueled. When I got married, we felt this was still a directive from God in our lives and boy am I grateful. Last year we weren’t as faithful to take these times of rest as we were during our first year, and I could feel the difference. Time away with our Father = better life. Sufficed to say, I’m greatly looking forward to this weekend! 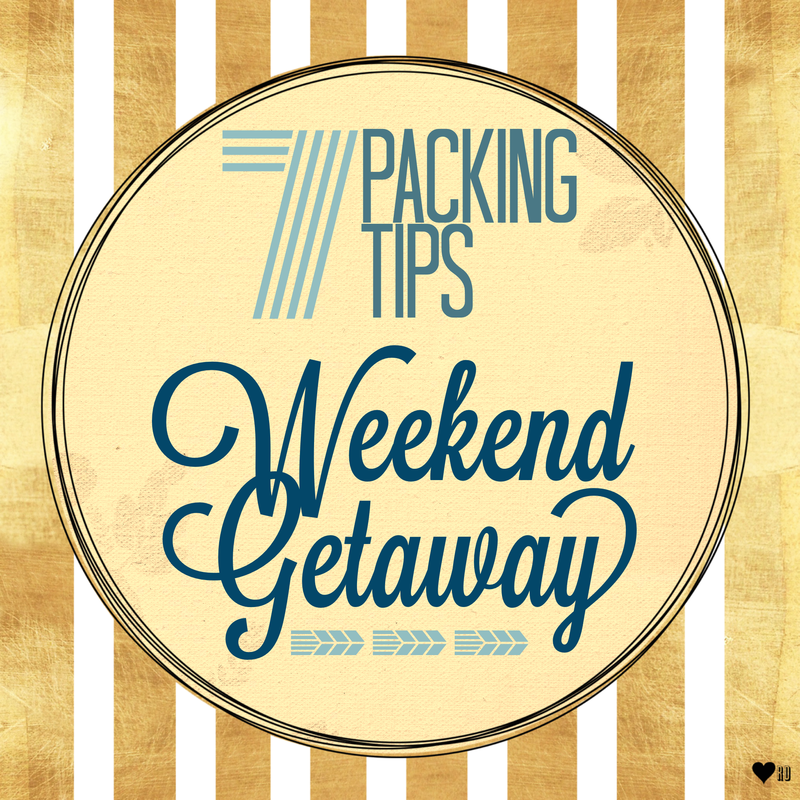 As I’m prepping myself for a fun time, let me give you some packing tips for a weekend away to help you on your own journey! Schedule a time on your calendar to pack. Last minute packing is a stresser! Choose what bag you’ll be using ahead of time that is appropriate for the number of days you’ll be away. This will help you not to overpack for short trips! Lay out your clothes prior to packing to make sure you have what you need. It’s easy to forget once it’s in the bag! Pack clothes according to outfits for the number of days you’ll be away. Since you’ll wear pants/skirts/shorts more than once (I’d definitely recommend that! ), pack the corresponding shirts/sweaters/blouses with them. This will make it more simple, and more quick, for you to get dressed each day so you get to relaxin’! Put shoes in the bottom of the bag first. Use a gallon size zip lock, a disposable shower cap, or plastic wrap in a pinch, to pack your shoes so that the bottoms of the shoes steer clear of your clothes. Roll your clothes, don’t fold them. This will give you far more space and helps avoid wrinkles in most cases. ‘Cuz nobody wants to iron when you’re outta town! Clean your house before you leave. It’s always much nicer to come home to a clean environment! Love that you started a blog! We are so much a like in all things organizationalness haha! Aww I miss you! Seriously we would still love to do a dinner with you guys and cook! How are you guys liking those penzey spices? Thanks, Mrs. Stone! ;) Loving those penzey spices!